Wholly Tired or Holy Tired? 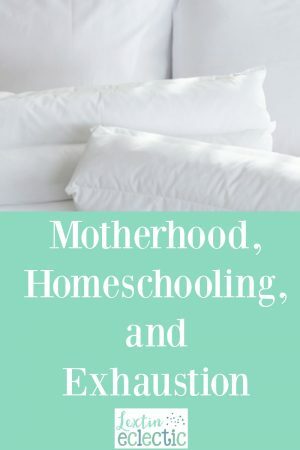 Homeschool mom, are you ever really, really tired? I know that I am. I have fallen asleep in the middle of the floor while my kids played legos around me. I have dozed off during our read aloud time. I have struggled through many a homeschool day while trying to stay awake. I’m going to share with you how a changed perspective has helped me continue through difficult and tiring days. When my husband came home from work last week, he found me sound asleep on the couch wearing my pj’s, fuzzy socks, 5 hair bows, a tiara, and several splotches of paint. Two kids were working on the puzzle not 2 feet from me. One child was on the floor eating a snack on the rug beneath me. Two other children were sword fighting with foam swords and super hero capes 3 feet behind the couch. I was blissfully sleeping through the mess and the chaos. Not even the shouts and screams that greeted Daddy as he walked in the door awoke me. Nope, I was truly dead to the world on that Thursday afternoon. My husband even tried speaking to me or waking me without any success. I never moved. He did check to make sure I was actually still alive, but once he was certain I was breathing, he kicked the kids outside to play some soccer with him so I could sleep in a quiet and empty house. I will admit that this was not the first time this scenario played out. There have been other times when my husband has arrived on the scene to find me sound asleep in the middle of the floor or in one of the children’s bean bag chairs. Other times I have sat down after dinner and promptly fallen asleep while sitting up. I have tried to read bedtime stories to the kids only to fall asleep after 2 pages, prompting the child to go find Daddy for him to finish. I try to go to bed early. I try to get adequate rest. I try to plan my days well and avoid over scheduling. But it simply doesn’t matter. Homeschooling – on every level – is simply exhausting. By the end of each day I am worn out and wholly tired. My exhaustion at the end of the day (especially by Friday afternoon) has led me to grumble and complain. No matter how I rearrange the schedule, plan ahead, take breaks, pre-cook meals, or enforce rest times, I am totally spent by the end of each week. This has caused me to reevaluate my priorities. I’ve cut out any extra activities and tried to plan well. But even with those changes, I know that I’ll still be exhausted. So, I’ve decided to change my perspective instead. I have the privilege of homeschooling. This may be the most difficult task I have ever undertaken, but it is a privilege to be able to teach my kids the things they want to learn and the topics that interest them. It’s exciting to teach them the concepts that they are ready to learn and see them understand, create, imagine, and remember. I made the choice to do this crazy thing. No one is forcing me to homeschool. It’s a choice I made several years ago with the support of my husband. I have to remind myself of this often – homeschooling is not a punishment but a privilege, no matter how challenging or exhausting it may be. This change in perspective has helped me continue on through the many long and tiring days of parenting and homeschooling little ones. Yes, by the end of my week I am tired in the worst way. My days are filled with loving, discipling, teaching, correcting, dreaming, encouraging, challenging, questioning, and inspiring my little people. Each day is full of art, reading, math, languages, grammar, history, and science. I get to open the door of learning wide and watch them dance and leap through. Their passions and excitement humbles and inspires me to never lose their childlike wonder. Each day is filled with conversations that give me glimpses into their innermost thoughts with a peak into their hearts and emotions. I have the job of shepherding them as they experience the world and know every emotion. So, rather than view myself as wholly tired I’d like to think that I’m holy tired. I’m exhausted from a week of good deeds that have encouraged and inspired. It’s a holy task to have little hearts entrusted to your care as you guide them to grow and learn. When I’m struggling to finish out my day or when I’m afraid I’m too tired to continue, I’ll remember that my exhaustion comes from being holy tired and I think that will give me the willpower that I need to continue on in this task day after day. Be encouraged homeschool momma. I’m sure you’re tired too. Know that you’re doing a good work. While your long, busy days are really just fleeting moments in the bigger picture of life, you have a lasting impact on the little ones that you encourage, challenge, inspire, and direct. And, praise God for a husband who is "ok" with letting momma get some extra rest! Beautiful perspective, though I do not know how you do all that you do! You are a busy momma!